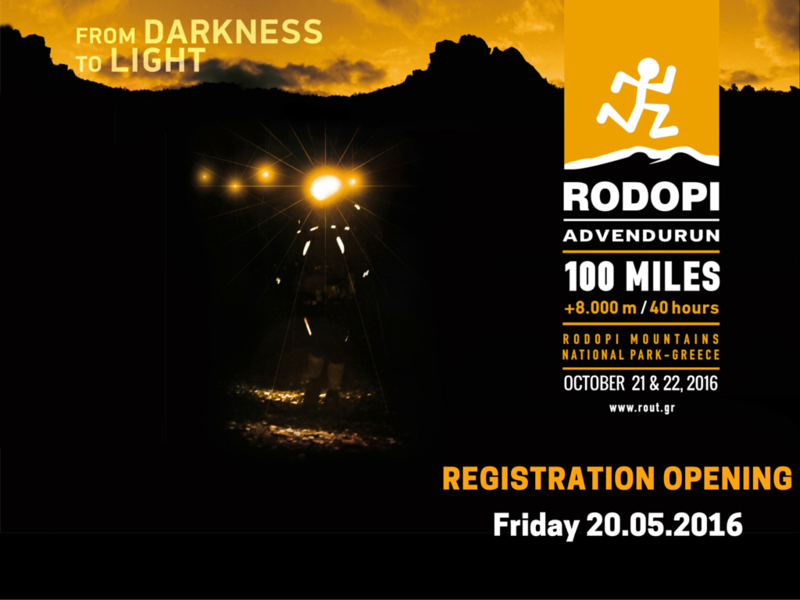 Starting Friday, May 20 at 22.00, registrations are open for the 7th edition of Rodopi Advendurun 100 miles (ROUT) of 2016. Registrations will use the online registration form (http://www.rout.gr/index.php?name=Rout&file=registration&newlang=english ) and will last until July 31. 150 athletes will be admitted to the race this year regardless of country of origin. Registration is a two-stage process, first the application for participation is approved and then you are notified to proceed with the fees payment. The payment period for those already fulfilling the criteria and thus approved to participate will begin on May 20 and will last until the 150 places are filled up or until July 31, if there are still openings. The organization will take special provisions to ensure a minimum number of starters are athletes residing outside Greece. The qualification criterion remains the same as in previous years, finishing in an approved trail race of at least 80 km over the past 3 years (2014, 2015,2016 ). The entry fee for this year's race will remain EUROS 120,00. Race course, rules and regulations will published within the forthcoming week (although there will be not substantial changes as of past year (cut-off to 40 hours). The Steering Committee of ROUT took care to instill consistently until today the philosophy of a race not confined to the narrow limits of an organized racing event but provides athletes with the opportunity to experience an immersion to the pristine nature of Rodopi mountains. Today, with the experience of six previous editions, adventure transpires the Rodopi Advendurun and this spirit will prevail in all our future endeavors. 1. GENERAL: "Rodopi Advendurun" (ROUT) is an ultra-endurance trail race with elements of adventure, which is held every October at the Rodopi Mountain Range, in northern Greece. Until 2012 the race was called "Rodopi Ultra Trail". The course is 164 kilometers (100 miles) and has +8000 meters elevation gain (approx). The area where the race is held is one of the most characteristic forests in Greece and is part of the Rodopi Mountain Range National Park, an area of rare natural beauty and biodiversity (habitat for bears, deer, wild goats, roe deer etc). The time limit (cut-off) of the race is 40 hours. The race has the same start and finish point, "Erymanthos" which is the Forest Village in the area of Haidou, north of Stavroupoli, Xanthi. To participate in ROUT essential abilities are required, like previous ultra trail race experience. 2. PHILOSOPHY: ROUT perceives the meaning of ultra-endurance as an expression of searching for the human limits through the contact with free and uncontrolled nature, which forces its rules demanding respect, awareness, courage, reserves of mental stamina and a lot of experience. Its basic parameters, define ROUT as a feat experience, which tests the physical and mental stamina of its athletes. For its organizers, ROUT is an "adventure race", in regard to the aspect of the uncertainty of the race effort, due to its big difficulty. The term adventure, is defined as the uncertainty of the outcome of an autonomous human effort in the open nature. In ROUT the external support of athletes is minimal, so they have to depend on themselves to face the subjective and objective difficulties of the race. Crossing completely uninhabited areas for a distance of 164 kilometers (100 miles), they become one with nature, which is a complicated and demanding procedure, but also is the very essence of the event. The philosophy of ROUT distills the up-to-date experience in ultra trail races, emphasizing in elements such as isolation, autonomy and independence, ingredient elements of adventure, which ROUT is trying to inculcate to its athletes. 3. CONDITIONS OF PARTICIPATION: The race is open to all those aged 20 years and above. Athletic documentation is not required, since it cannot document one's ability to take part in a test that surpasses the so called athletic limits. Interested parties submit an application and if they fulfill the required criterion, having completed at least one trail race longer than 50 miles (80 kilometers) during the 3 last calendar years (2014, 2015, 2016), their participation in the race is approved. For the two 50 mile races that take place up to now in Greece "Rodopi Challenge" and "TERA" the participation criterion is having completed the race in 17 and 21 hours respectively. In any case, the organization has the right to turn down an application despite the fact that it may fulfill the typical criteria that have been set for reasons that it is not obliged to explain to the interested party. Athletes that have been disqualified from this or a different race in the past for a serious ethical offense such as a heavy case of deception or violent behavior, are not accepted. 5. PARTICIPATION CRITERIA: The participation criterion for ROUT is the documented experience of an athlete in similar races, which are characterized as "trail races". The organization believes that the experience in "public road" long distance races does not provide the ability to successfully face the difficulties of an ultra trail race like ROUT, with special requirements of familiarization with the mountain surroundings in general and in particular with the singularities of the field, the climate conditions, the absence of frequent support and the psychological tension that are caused by solitude and the unknown elements that differentiate the race largely from a "road" race. 80 kilometers (50 miles) are set as a minimum distance for a participation criterion-race, whether it is a completed finished 80K race (note: 17 hours for "Rodopi Challenge" and 21 hours for "TERA"), or a withdrawal after the 100th kilometer at a longer race. Rout is an exception, where the criterion is the withdrawal at Κ-92 and later (Yioumourlou). The criterion-race that will be submitted must have taken place in the last 3 calendar years (2013, 2014, 2015). a) REGISTRATION: Participation applications are submitted between May 20th until July 31st, 2016.
b) SELECTION: The organization immediately informs the athletes that are selected to participate. c) PAYMENT: The athletes that receive the participation approval, must pay the participation fee. After the end of the registration period, the athletes that have not responded, lose the right to participate.